Unlike the previous Rivers of London novels Aaronovitch really lets the dam of information loose with this one. Not only do readers discover important information about the Faceless Man, but other practitioners are introduced, new forma practiced, and there’s even an explanation as to why Leslie was taken in the first place! Now if none of that means anything to you then the first thing I would recommend for you to do is read the previous Rivers of London books. If you haven’t read them, you may be wondering what they are like? Well, I think the best explanation is they are a bit like a combination of NCSI/CSI/(pick your choice of systematic police procedurals) and Harry Dresden/Patricia Briggs (insert magic society book). So, what does that mean for you as a reader? Well, it means that there are magical battles, people slinging spells, magical creatures and entities, and lots of paper work. Yes, you heard me right, paperwork. This is one of the most unique things about the Rivers of London series, how real and detailed the police work elements of the story are. Peter, the protagonist, uses the scientific method to discover magical limitations, stories often involve police hierarchy problems (who has jurisdiction and what not, resource allocation, and who’s problem a case is when it goes south), massive amounts of field work (going door to door, research, ect…), more paper work than you can shake a stick at. As for The Hanging Tree, specifically, it’s full of action, suspense, awesome magic with a gripping mystery tying the story all together. Each book expands the world and characters in this fantastic series, making them increasingly harder to put down. 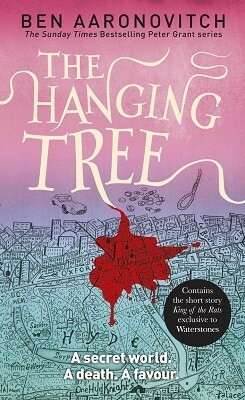 I personally love this series and feel that Aaronovitch has become one of those authors that I’m always anxiously awaiting their next book (which is a great sign for a great series).